Banish unwanted body hair and deal with ingrown hairs with our range of hair removal products. Getting rid of hair is easy once you have the right tools. But you want to make sure you take care of your skin when you remove your hair to avoid sore and uncomfortable ingrown hairs and razor bumps.Prices are Inclusive of GST (sales Tax). 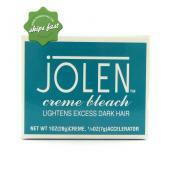 Jolen cream bleach lightens dark hair on face, arms, body and brow. This package contains a Jolen creme and a Jolen accelerator. Help to remove unwanted hair and keep your body smooth with a little help from Nads Natural Warm Wax. It's infused with the fruitilicious fragrance of Sangria and Orange Blossom, this dermatologically tested product is suitable even for sensitive skin. Want to remove unwanted hair "down there" and style your intimate region? Nad's Brazilian + Bikini hard wax has been specifically designed for the areas with thicker, coarser hair like the bikini area or underarms. We also stock a few products to help you prevent and/or deal with ingrown hairs and razor pumps so your skin can stay soft and smooth.